Incredibly bright, replaces any standard bare light bulb. These incredibly bright, efficient lamps replace any standard bare light bulb-two options available, equivalent to up to three 100W incandescent bulbs! 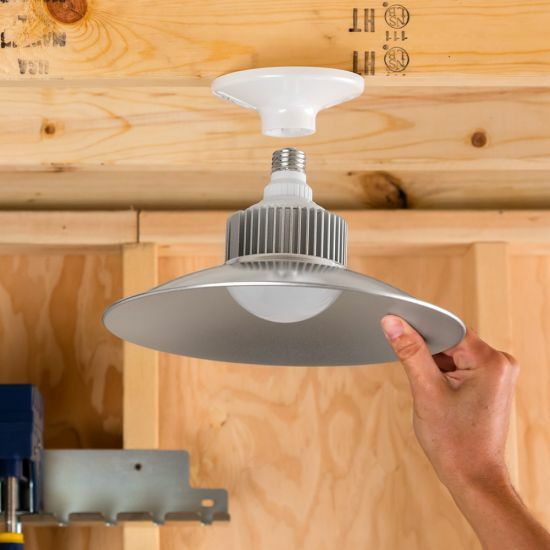 Here's an easy way to install a no-nonsense lighting solution in your shop, garage, closet or storage area. Just unscrew the standard bare bulb and screw this one in—it couldn't be any simpler. Choose from 2500- or 4400-lumen lights, equivalent to two or three 100W incandescent bulbs, respectively. It provides instant-on performance in cold weather (as low as -4°F), and you get the energy savings and longevity that has made LED lighting a top choice in the modern home. Really bright and lights up my garage. shop. It is a reallly good bright light for my garage. I have 4 of them in there. Great purchase! I bought 3 of the 4400 lumins version. Maybe could have gone with the smaller one, but I have 20’ a ceiling in my shop and I want it to be bright. Totally beats replacing the fixtures. Let’s see if they last the full 5year warranty period. Lit up my basement like day...wonderful product. I got this for an area that needed better lighting, it is good but that area would be better w/o a reflector. So we ordered 2 w/o any reflectors and we will let you know a bit down the road how it is . The LED shop lights are great. My garage has an eleven foot high ceiling with only two light fixtures. Nothing I've tried ever worked to give me enough light for woodworking. The two larger LED lights more than doubled my lighting. Ordering them from Rockler was easy and they showed up on the day I was expecting them to. I recommend these lights and buying them from Rockler. Nice and bright...may add another to other end of shop. I really like the LED Shop Lights with Reflector Shrouds. They really light up my shop. Very satisfied. They are exactly what I wanted. Super bright. 35ft wide by 40ft deep and 16ft high. Six lights. Great amount of light! Perfect for the area I use. Great lights! Very bright! I have them mounted 9’ high and they’re great! This is a great light. It's easy to install, just screw it in an existing socket. I installed it my basement work area. I may buy another to put in my garage. The last lights are bright, clean and attractive. We installed these in our utilty/craft room. They dramatically improved the downward lighting! Due to the reflective shield, they reduced lighting on the perimeter of the room. This is fine for us, but that may be an issue for others. I purchased 2 - 2500 lumen and 2 - 4400 lumen shop lights with reflector shrouds. My shop is rather small. 12’ x 14’. Great lighting makes it feel much larger and just being able to see your work projects well, with no shadows. This is a very effective investment. Love the electric cost. The 4400 lumens uses about 55 watts of power. Works well in lighting a garage and a shop too. I replaced 2 8 foot double fluorescents with 2 of these and it's brighter! I was fixing to replace the bulbs and ballasts for 2 8 foot (double) fluorescent lights at a cost of close to $150 for the third time in 10 years, so I decided to try these lamp fixtures to compare. They work like a charm and the light is brighter than with the four 8 foot tubes! This is both a money saver and an improvement in the lighting in my garage! I'm obviously, very happy. Nice and bright. Just the thing I needed to light up my shop. Replaced LED 100 watt equivalent bulbs . 100% more light on work surface . I put two in the garage and it is much brighter in there now. They replaced two 300 watt bulbs and there is way more light then before. Would recommend them to everyone. My workshop area is in my detached two-car (and currently unheated!) garage. Living in upstate New York, it's not uncommon for our garage's interior temperature to hover at 20 degrees or lower for the winter months. This product comes on (unlike most fluorescent lights), and reaches full brightness almost immediately (unlike most LED bulbs advertised at "outdoor" products). My work area is brightly lit now, and I plan to purchase at least two more of these to cover a parking areas as well. A very fine light. Originally ordered three, just reordered two more. Lots of even light, pleasant color, fast starting, good looking, great value. What more could I want? This is a great item. Does exactly what it is designed to do. 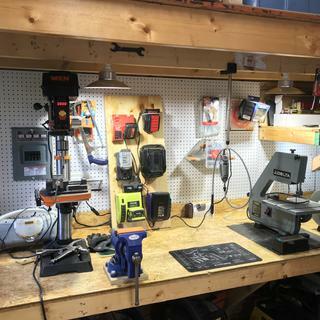 Made a dim and dark section of my workshop brighter then the rest of the shop. SO easy to install. I eliminated 3 florescent shop light fixtures and put in 2 of the 2500 lumen LED fixtures and they gave me better and brighter light than what I had. Excellent for what I needed.Very bright. Now i need more! My wife loves how these brightened up our storage room. These are the best lights ever! Super bright. I use them in basement and garage and love them! The reflector shield and LED light make a difference in my dimly lit garage and work space. I like them so much I installed them throughout my two double garages. This is really a great light. Puts out a lot of light really brightens up garage. The fixtures light exposure covers a larger area than conventional bulbs and does not strain my 15 amp breaker. Easily installed, provides a bright light for our dark basement. Planning to add a couple more in my shop. I put this light in my garage so I can work on projects in the evening. It is very bright and I am quite happy with it. I wish I had additional overhead light fixtures in my garage so I could have more of these lights throughout the garage. This unit puts out extraordinary lighting. I will buy more of them. Already have some and they work great. To light my paint room. Interested in LED technology. If they are bright enough, I may order more??? They will upgrade my garage lighting. Good price and I need good lights. My husband thinks these are the best lights for his working area so we decided to purchase 2 more for the garage. They really illuminate the dark recesses of our cupboards. We have one already and am very pleased with the amount of light it gives off. Always wanted these lights for my shop. The Rockler sale price sealed the deal. Tired of shadows and fluorescent bulbs. Hoping these make the shop brighter and more worry free. Already own three of these and they are performing very well. 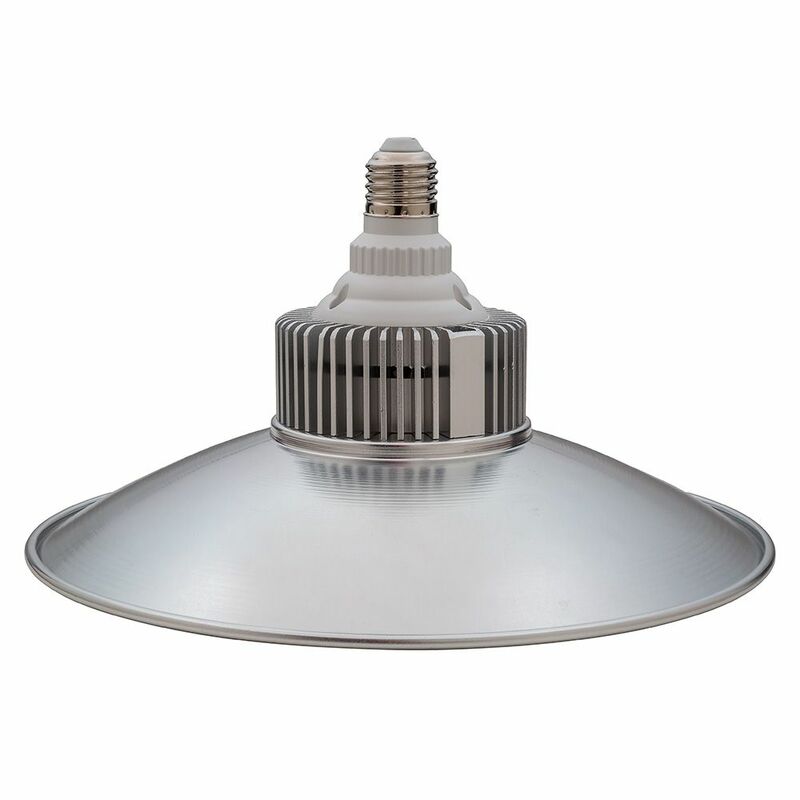 The LED lights allow me to increase the lumens without exceeding the wattage limit of the socket. Got one as a gift and I loved it in my shop. Ordering more of these for my wife's craft room. She saw these in our pole barn and wanted a few for her shop to replace standard fluorescents. Bright light for the shop and barn. 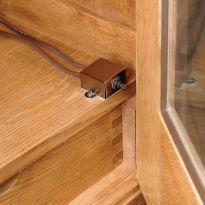 replaces the regular led bulbs in barn with a better focused light due to the shroud. They put off amazing light. Ordered 2 and want 2 more. previously order to see if I liked them and they are wonderful and make a huge difference in work area. I just love them. I'm a retired electrical contractor and I'm into lots of light. I have a number of these lights in my shop and have been very pleased with the light produced. I highly recommend this product. simple to install already existing fixtures, saw You tube video and it seemed bright enogugh. Will know once I install with other lights. 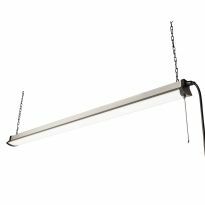 I have two fixtures that take only a single bulb and currently have fluorescent bulbs in them now which does not provide adequate light. I think the LED'S will be better. Sound like a good lighting that will made by workroom brighter. Awesome light, needed a second! I've owned a couple of the 4400 Lumen versions for several years now, and at first I thought it was actually too bright, but now, I really like it as task lighting. What I needed and it was on sale. I bought a previous LED Shop light and really was impressed with it. Can you replace the bulb and reuse the reflector if the bulb dies? BEST ANSWER: No, this is all in one. The reflector does not separate. What is the color temperature (K) of this bulb, and what is the CRI? BEST ANSWER: Color temperature is 4000K, CRI is 80 according to the manufacturer's (Keystone) website. The CRI for the 2500 Lumen bulb is 70, not 80. Will these bulbs fit into a recessed can? Is this light UL listed? BEST ANSWER: No, it is ETL listed. Here in Arizona my shop area summer air temperature will exceed 110 degrees F frequently and may at times exceed 120 degrees. Will this fixture withstand this and if I turn it on at this temperature how long will it last? BEST ANSWER: The Technical Details list the operating temperature as -4 to +104F, so you'd be taking your chances. Even in the hottest time here in Arizona I turn on my Swamp cooler and have never had a problem with the LED lights. will this fit in a 6 in can housing? Short answer - no. That is, unless you want to get some metal shears and cut away the reflector. Yes, not inside the recessed can, but under it. But you have to bring the internal socket down in the recessed can in order to meet the base of the bulb. Then the new, large LED bulb will hang below the can, and hide the old hole, because the trim ring and old reflector were removed to gain access to the wing nut. (The wing nut sits in a groove, and allows the light socket to slide down far enough to contact the new bulb's threaded base). Can it be used outdoors too? Can this light be used with a dimmer? BEST ANSWER: It says NOT dimmable. Who is the manufacturer? Is it Keystone Lighting? 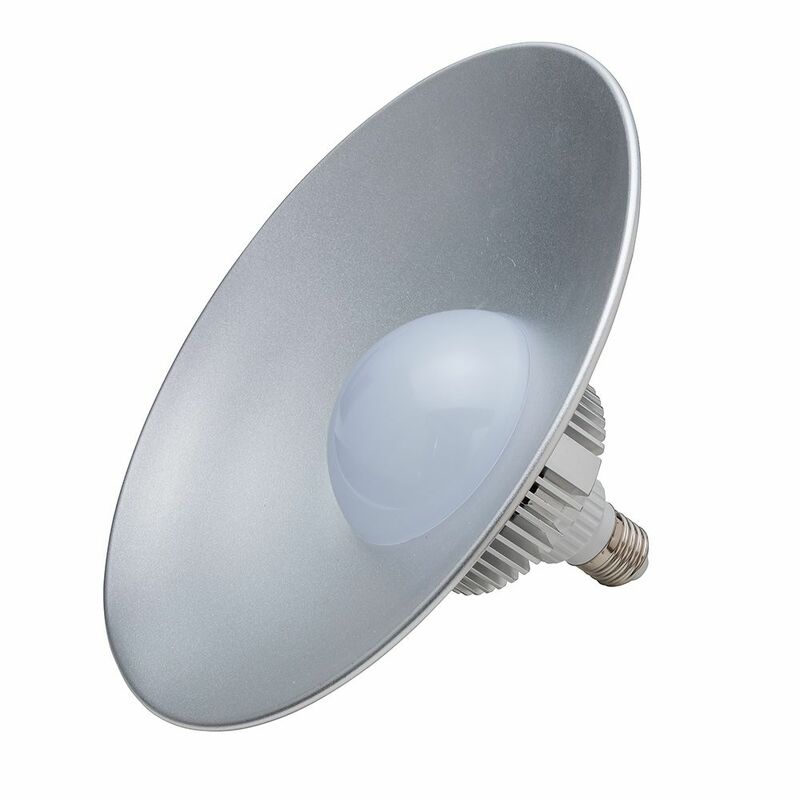 Please add the Color Temperature of the LED Light to the specifications. BEST ANSWER: Correlated Color Temperature (CCT) is listed on the product packaging it is 4000k ." Cool" colors have higher Kelvin temperatures (3600-5500 K) "Warm" colors have lower temperatures (2700-3500k) 4000K would be considered a bright white. How widely dispersed is the light? If it is 4' above a workbench, will it throw a circle of light in the middle, or does the light actually follow the dispersion pattern implied by the wide reflector? I know it won't throw light sideways, like a bare incandescent, but is this more of a spot light pattern, or flood? I use the lights as generallighting in my shop. They work well. 2 bulbs cover my 20x12 shop. It is more like a spot light pattern. My shop is 30 x 50 with 12 foot ceilings. I currently have 16 4ft T8 fluorescent fixtures with bright white bulbs. (2 bulbs per fixture). I like the amount of light these put out, but hate replacing bulbs all the time. How many of the 4400 LED bulbs would I need to replace my fixtures with equal amount of light output? How cold can this light operate at? BEST ANSWER: I haven't yet had this for a winter yet, but the manufacturer told me that it would operate down to -4 degrees F. I bought it to use in an unheated pole barn and it has performed well down into the high 20's so far. My 4400 lumens light just went out. It only lasted about a year in my garage. It started blinking then only half was lit them it went out. Any reason why? BEST ANSWER: Not sure why they went out. I've had mine for 3 years and they are fine however when they are on they interference with the FM reception on my receiver in the same garage. 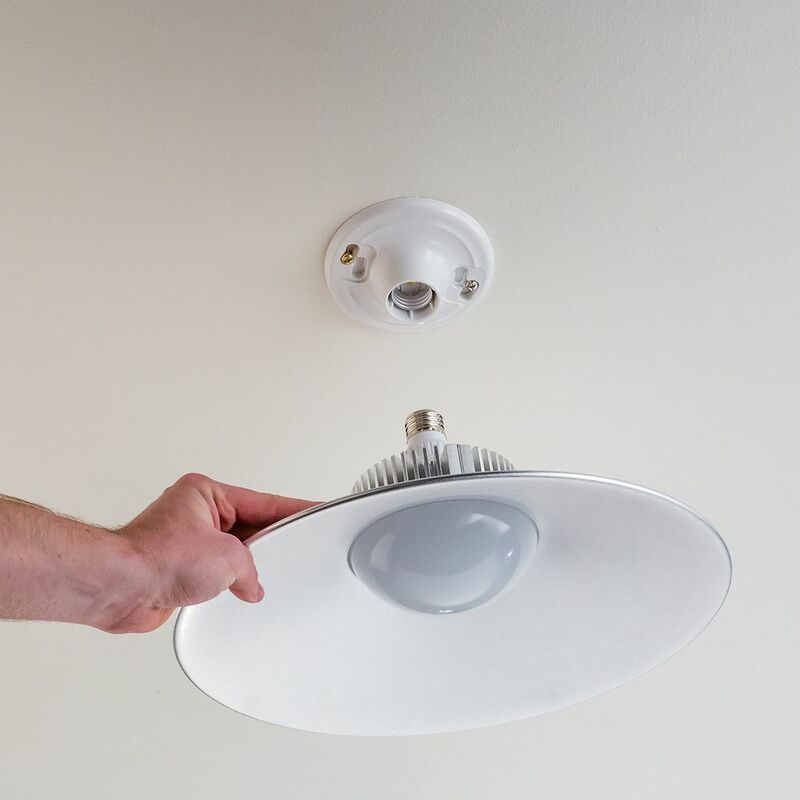 The cause for light fixture failure falls in the same categories as most electric/electronic equipment, namely heat, voltage supply or manufacturing defect. I suggest you confirm they are installed as too hot and also check that they are receiving 115 volts. Also make sure the socket is good shape and the is not corroded. Lastly take the light apart and inspect the circuit board for discoloration and burned out components. I’ve had two of the 4400 for the past three years and I’ve had good luck with them. No idea why they would suddenly stopped working because I thought they were guaranteed for many many hours.Enter an answer to this question. I have 4 in my garage and I work for Rockler Woodworking. This was the oldest one and is the one that is turned on every time I go into the garage. I do not fully understand how they work so not much help here. There are YouTube vids about how some can be fixed. Good luck. Check the voltage in your garage and any grounding outlets. Voltage and grounding checks out ok. I have 4 of these in my garage, but this one is the oldest and the one I turn on every time I go into the garage. What is the power consumption in watts? BEST ANSWER: For the larger 4400 lumen light it is 55 watts. From the above specs: "Wattage: 30W"
can you change bulb or do you have to replace whole thing when light burns out? BEST ANSWER: You would replace the whole. 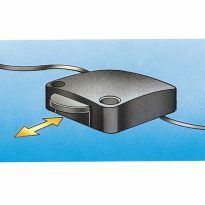 Any problem using the 2500 lumen model in a socket with pull cord for turning on/off? BEST ANSWER: I added pull switch sockets to a few of the ones I use on my 12' ceilings so I could turn a few off when not in use (the rest run off a light switch). I extended the pull string out horizontally about 18" through an eye bolt before dropping towards the floor. Best to use strong string through the eye bolt for smooth action rather than the standard ball chain, but it works great. Thanks Thomas. Nice, simple solution! The BEST ANSWER truly is the best answer! I wish I had read these questions before using our light in a basement fixture with a pull cord. Last week, as I pulled the cord to turn on the light, the whole fixture snapped away from the light fixture and slammed to the concrete floor. Luckily it didn't hit me. I guess the pull cord bent the shroud a bit each time we turned it on, weakening it. The plastic housing attached to the stem that screws into the light fixture was what broke. I think your pullcord is getting snagged by the heatsink (the 2500 lumen model doesn't have a shroud). Try routing your pullcord through an eyescrew mounted off to the side. It's likely that the cord will pull down at the reflector and possibly bend it. Depending upon how high the light is, you may have to pull the cord straight our over the top of the shroud. Otherwise, I highly recommend this light. It is truly a gem. I have a light switch to turn on-off.No problems. Thanks Lou. I wondered about that - and heat affecting the string/twine pull cord. I have a 40 x 40 shop with 20 foot ceilings. How many of the 4400's would I need to get proper lighting for woodworking? BEST ANSWER: I have a 30X40 metal shop insulated and six 2x4's high output LED lamps with 6 bulbs in each and it barely lights it up. Plus you're going to need to drop the light fixtures down to about 10 feet that might help. 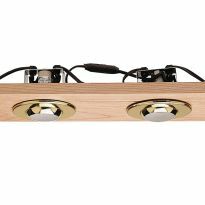 I'm sorry but I can't see how these would light up a shop that size without spending a large fortune and it would have a fixture ever 10', sorry I couldn't have been more positive on these. I've got 4 of these in a two car garage suspended from the ceiling two feet and they do a wonderful job. And they are about 10' apart. Normal ceiling height. I believe that I purchased three of the 2500 lumens lights for my 30 x 20 garage and they provide plenty of light. I would think that 4 of the 4400 lumens lights would give all the light you might need. However, check with others if you can who might have a similar size area. I have a 20x20 garage and I use 2 fixtures an it’s great for repairs. My best estimate for you is 6 or 8. They will dim slightly over time so 8 would be best. I would think at least fifteen. With another for each machine. I'm a woodworker myself ,so proper lighting is a must. Never skrimp on shop lights. Could this be attached to a cord ending in a socket and suspended from the ceiling (like a pendant light)? BEST ANSWER: I don't see any reason why you couldn't do that. Yes it could be. 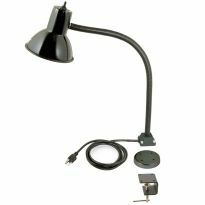 The cord attachment to both the socket and ceiling fixture must be able to carry the weight of this shop light and the cord attachment must be able to handle whatever abuse this hanging fixture may receive. In other words, cord attachment like used for hanging outlets in shops would be OK. A socket hanging with a piece of 18-2 zip cord would be inadequate in my opinion. Yes, assuming the cord is not very light weight. This has a standard light bulb base, so it should work as you describe. Absolutely, that's exactly how one of mine is set up. I don't see why it couldn't. 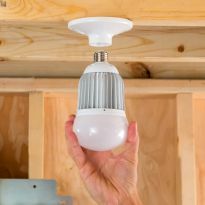 Will this light fit up into a recessed can? 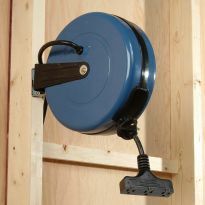 I have the standard 6" recessed can lights and just need to know if it has a long enough "stem" to work with these cans. BEST ANSWER: Sorry no, this will not have enough length to fit into a recess can. I bought can light replacement LED lights from COSTCO and LOVE them! Extremely bright and only 21.5 watts. Easy to install. 2 Pk for just over $26. Yes I've seen those. I just need more light in the room and the cans really deflect a lot of the light. I am going to use these with a base extender. Should work great. Thanks for your time. Light bulb extenders are available in various sites. They just extend the socket a few inches. Enter an ause Edison-medium base lamp porcelain extendersnswer to this question. Yep. That's what I thought. Thanks. I don't think it's designed for that! Heating issues?! I want to put this in my garage, which has sheet rocked ceilings. Will this give me more light than the similar light without the shroud? BEST ANSWER: This light will throw more light down and less up. The less indirect light will make the ceiling seem to be less lit. I have both reflector style and bare bulbs of this type from Rockler and I prefer the bare bulbs without the reflector. Both are very good lights and I give them a 5 star rating. Get the more powerful one for maximum lighting. I have both the light with the reflector and the version without the reflector in my shop. The reflector version does a much better job of lighting the work area. However, the ceiling in my shop is not sheet-rocked, just the exposed joists, so my situation is a bit different than yours. I think I would still go for the reflector version. It won't furnish any additional light - it is more 'directed'. Without the shroud means that the light would be more evenly dispersed, and directed downwards. The shroud helps reflect more light downwards which is where it’s needed. I like the way it lights up the area beneath it. I have both and prefer without shroud. The with shroud throws a shadow if near a wall or anything of height. Heads up. I bought one for my utility room which has a motion sensor - this does not work on a sensor? BEST ANSWER: OK... it should. As long as the sensor is in the main light housing. Think of this LED light as a ginormous light bulb. I put it up in the wife's garage so that I do not have to keep replacing the bulbs. No she wants me to put one more up to make it like daylight in there. you have received some wrong answers. motion sensors have nothing whatever to do with dimming. the motion sensor is just another form of switch. It either sends power to the light, or it does not...depending on whether motion is sensed. Trust me, the light gets the very same power as if it were a manual switch. It cares not what caused the power to be sent. The only problem you might anticipate is if you did a lot of detail work at a work table while sitting pretty still. The light might very well go off eventually because it is not sensing movement. If you were using something like a drill press and not moving much for a while, it could be dangerous if it unexpectedly went to blackout. If I were using motion switches in a shop, I would be sure to have a secondary smaller light that would for sure stay on. It's not a dimmable LED. Anytime you're using a sensor, you have to make sure to get one that's specially dimmable. For me, the output of this light was a huge draw. It does exactly what I need it to do. It replaced the one light in my garage with one that can actually light up the place. I almost don't need shop lights with this in the light socket! I have not tried it on a motion sensor. It works fantastically on a regular switch. Isn't a motion detector simply an automated switch? Don't know why it wouldn't. It screws into the socket like a normal lightbulb. Is there a warranty to these bulbs? BEST ANSWER: I don't know about a warranty, but both bulbs I purchased died after seven months use. The LEDs are advertised as many thousand hour, but the electronics are not! I have stopped shopping at Rockler because of this. I'm not sure about the warranty but I completely filled my shop with them a couple years ago and they are amazing. Have had no trouble. Lit the place up like your local Walmart. I recommend. I do not know about a warranty but I bought two of these two years ago and they have worked well - no problems. Can 3 of this lights work with one light switch, wattage wise? BEST ANSWER: Absolutely. The current draw for these LED lights is low enough so you should not have an issue. Though you may need sun glasses at night in the area of use as the the lumen level is high, thus the light level will be equal to a very bright day. 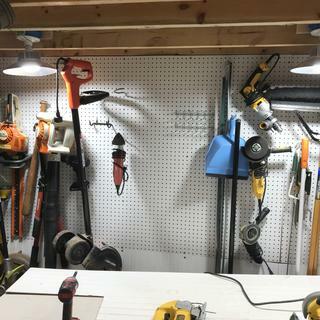 I use two in my garage workshop and the illumination is outstanding. Yes, Most household switches are rated for several hundreds of watts.... much more than three of these LEDs. What kind of warranty is on these fixtures ? BEST ANSWER: I've had these lights for a while, so any warranty information in the package is long gone. However, construction is sturdy, the lights are essentially one part, and LED lights have long predicted lifetimes. Yes, what you say maybe true or is true but I have a something to add. I had one that went out less than 6 months with very little usage. After contacted Rocker I was told one would being shipped out. And now I have one that is flickering. First contact with Rockler was on the 13th. Today is the 21st of Nov.Just not in a timely order. Not sure about warranty but I have had one these lights on continuously for 3 years. Why not check with Rockler customer service? 30,000 hours is a bunch of hours. Can the shroud be removed? I want more light dispersion. BEST ANSWER: No, but Rockler sells LED Big Bulbs that don't have the shroud. They disperse light better - including up on the ceiling which seems exactly what you are looking for. Then, I think you could cut away the shroud. Doesn't look like you can disassemble, but i see no reason why you couldn't cut it out with tin snips or a saw. Not really, it is an integral part of the assembly. I think it helps with thermal dissipation too. Is this base slightly undersized? Can't get it to fasten to a porcelain or plastic ceiling fixture without being loose and wobbly. Once you think it's in, it's not straight or even tight. BEST ANSWER: I have mine installed in a porcelain fixture with a pull chain off/on switch. It fits snugly and doesn't wobble. I also tried putting it in a plastic ceiling fixture, also with a pull chain off/on switch, and it fits snugly. Do your ceiling fixtures have a pull chain, or just standard types? Maybe that is the problem. for me it's slightly loose and wobbly but not visibly off kilter and certainly not in danger of falling out. Doesn't give one great confidence but it's never had any connection problems either. Once fully seated it's fine! Check the socket with a standard bulb? Sometimes old sockets are damaged and we don't realize it! Replace the socket! Can this be used in an indoor pendant light socket? Whether hardwired or plug-in? Does the base get very hot? BEST ANSWER: have not noticed any excessive heat in the base. I would think it would fit in a indoor pendant socket. However it will all depend on the depth of the pendent shroud. Thank you. Pendant would be bare, open socket. Sounds like this light with built-in shroud would work fine. 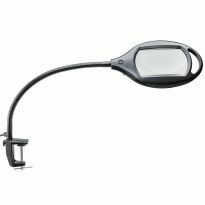 Have gimpy eyes and have been searching for a way to get more light in a few areas without having to install "shop lights". e.g. in closets and over my indoor work table. Only big concern was if base gets so hot it damages socket and/or wiring in socket. I am thinking LEDs don't get as hot as incandescents at 150 w+. Thanks, again. I'M not sure I'm currently using my light in a ceramic fixture in my garage. Approximately how many hours can one expect from this bulb? BEST ANSWER: Per the manufacturer, it is rated to last 30,000 hours. That's wierd the timer would not work with LED bulbs. If the timer is wired as a switch, it shouldn't matter what you have for a bulb since it simply breaks the supply of electricity. Thank you for your answer. Well Ron a normal switch should have no effect on a lamp, the problem is in the electronic occupancy sensor. It reads light value and has sort of a dimmer function. That problem showed up well with my outdoor sensors. If the sensors tripped a simple relay it should work on all types of bulbs, but I'm sure the voltage going to the fixture is going through some electronic switching device that does not allow LED bulbs to operate properly. The proof is the industry has change the manufacture of these types of sensors. I just hooked up a timer switch to a bank of LED 4' (like fluoresent lights, only LED), and it turns them off and on just fine. I just don't see what the end light would have anything to do with the switch. It simply opens and closes the circuit, or flow of electricity, no matter what the electricity flows to. However this isn't an occupancy sensor, it is a timer that opens the switch at a certain time, and closes it at a certain time...regardless of whether you're standing in front of it or not. You are correct a simple timer operates like a standard wall switch . I know we are way off your orignal question I hope that the led lights last a long time . Are you able to dim the lights? BEST ANSWER: Spec. say Not Dimmable. I don’t know, because my shop lights don’ have a dimmer switch. I don’t recall anything about them being dimmer compatible in the documentation or packaging. They are, however, excellent lights. I haven't had a need to, they're in my shop and I prefer full light, but I don't see why you couldn't. I would check with the manufacturer.